You never need an occasion to set aside a romantic evening for you and your favorite plus one, and New Orleans offers up plenty of romance year-round. There are lots of ways to spend Valentine’s Day in New Orleans, and even more ways to connect as a couple after the sun goes down. Read on for 7 of our favorite romantic date night ideas to help you craft your own intimate New Orleans evening! 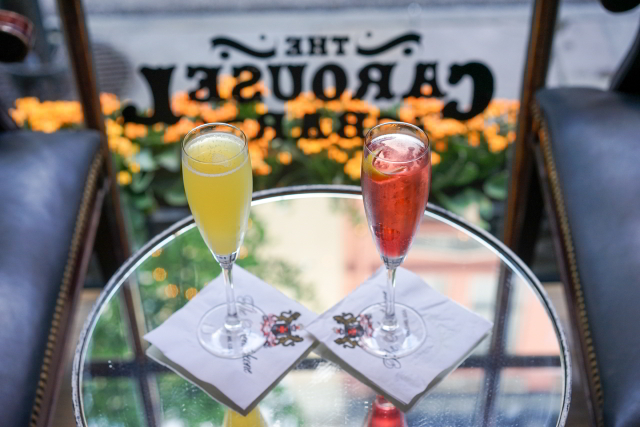 Start your romantic date night in the French Quarter with cocktails for two at The Carousel Bar & Lounge. 1. Start the night with a cocktail at The Carousel Bar & Lounge. We’re a bit biased, of course, but we think our hotel is a great place to start your romantic night off right. The Carousel Bar & Lounge serves up signature cocktails like the French 007 (sparkling wine and pomegranate liqueur are a fantastic combination), or you can consult our knowledgeable bartenders for the perfect glass of wine. The atmosphere is bustling, yet intimate, and our live jazz music in the background sets the tone for romance. The bar bites menu is the perfect choice for a light dinner. Pair the blue crab and crawfish beignets with a glass of Carabella Pinot Noir, or share the shrimp pot stickers while sipping the Fleur des Lis cocktail – it’s a refreshing blend of Hendrick’s gin, St. Germaine, ginger ale, and cucumber that brings out the Asian flavors of the pot stickers. Get there early to grab a seat at the famous rotating bar. 2. Take in a burlesque show together. New Orleans offers a thriving nightlife scene, including cabaret and burlesque shows with inspirations ranging from traditional vaudeville to geek chic. Nothing inspires a little romance quite like witnessing a classically inspired striptease. Pick up a free Gambit Weekly magazine at most local coffee shops for a full listing of the week’s events. Bustout Burlesque, Fleur de Tease and Bella Blue Entertainment host regular shows throughout the downtown area. 3. Or snuggle up while you watch an indie film. If burlesque isn’t quite your cup of tea, there are plenty of other things to watch while you cozy up with your honey. The Theatres at Canal Place are within walking distance of our hotel. They show a mix of mainstream movies and indie films in a plush, yet intimate seating arrangement. Order tapas, wine and cocktails right from your seat while you watch. You can also venture out to The Broad Theater, a newly renovated four-screen cinema in Mid-City or visit the historic Prytania Theatre. This single-screen movie theater was built in 1914 and is referenced in the book A Confederacy of Dunces. 4. Find a gift for your sweetie at the Frenchmen Art Market. 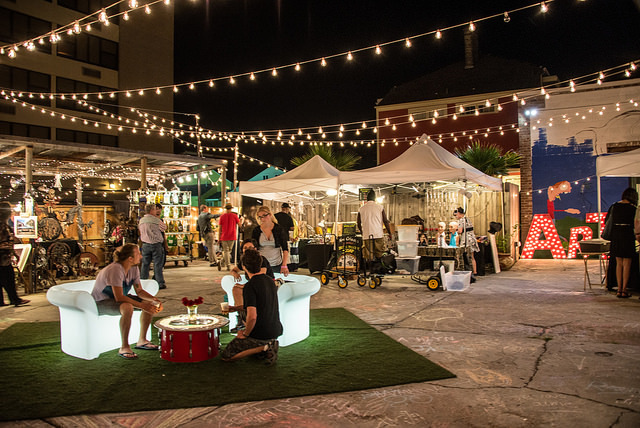 Located in the heart of the Frenchmen Street nightlife district, the Frenchmen Art Market features local artists and makers hawking their wares under a canopy of twinkling lights. Only open at nighttime, Thursdays through Mondays, this romantic setting evokes a European sensibility with the best of Southern charm. The original location is at 619 Frenchmen Street, but the market has recently expanded to add a second location, called The Art Garage, in the bustling St. Claude Arts District. 5. Take a cruise on the Mississippi River. Head to the waterfront for a moonlit cruise on the Mississippi River. The Steamboat Natchez and Creole Queen steamboat both offer Valentine’s Day river cruises sure to elicit lasting memories. There’s nothing quite like watching the city roll slowly by from the middle of the Mighty Mississippi. 6. Wander Jackson Square and have your fortune read. Sometimes, the most mundane activities are the most romantic. 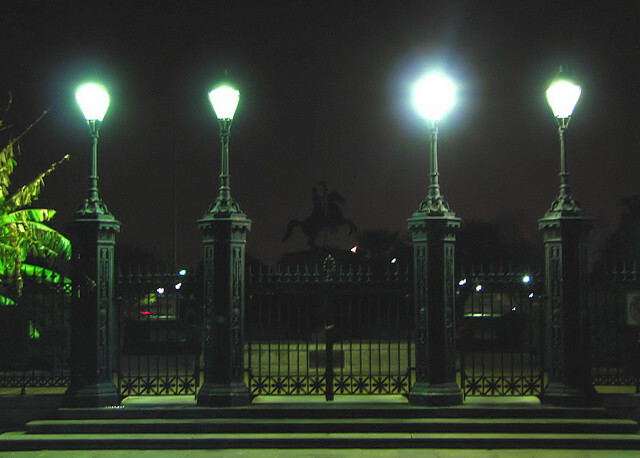 A slow stroll through Jackson Square under starlight can be incredibly romantic – perhaps you’ll hear live music from a street musician and dance, or maybe you’ll share an order of beignets at Café du Monde across the street. (They’re open 24 hours!) If you’re the adventurous type, have your fortune read by one of the many palm readers and psychics found throughout Jackson Square. 7. Share a tiki cocktail at Beachbum Berry’s Latitude 29. Before heading back to your hotel room, be sure to make a final stop at Latitude 29, housed inside our sister hotel Bienville House. Indulge in the romance of the evening by sharing a cocktail made for two. The Aquadesiac is a delightful blend of Gold Barbados rum and Blue Curaçao teased with lemon, almond, caraway and Bénédictine. Savor the sips while you stare lovingly into each other’s eyes. Book a romantic getaway today! Ready to enjoy a romantic weekend in New Orleans? Whether it’s a staycation you’re longing for, or it’s your first visit to the Crescent City, Hotel Monteleone offers the perfect romantic place to stay in the French Quarter. Better yet, book our Romantic Interlude Package, which includes champagne and chocolate-covered strawberries on arrival, a three-course romantic dinner including a bottle of house wine at Criollo Restaurant, breakfast at Criollo Restaurant for one morning of your stay, cafe au lait and beignets at Cafe Du Monde for one morning of your stay, plus a 10% discount at Spa Aria, our onsite spa.